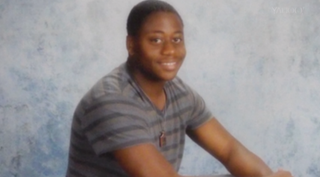 Lennon Lacy's mom, Claudia Lacy, is willing to believe that her 17-year-old son committed suicide back in August in Bladenboro, N.C., if it is proved and explained to her, but so far the grieving mother isn't seeing the evidence or the pursuit of justice that she needs, CNN reports. "That's all I've ever asked for: what is due, owed rightfully to me and my family—justice. Prove to me what happened to my child," Lacy told the network, adding that she doesn't have confidence in local law enforcement: neither the Bladenboro Police Department nor the North Carolina State Bureau of Investigation. When asked by CNN if she believed that her son was lynched, Lacy answered, "Yes." The FBI stepped in after hard questions were raised about why the teen, who seemingly had no issues, hanged himself—and even how he did so. According to CNN, Florida-based forensic pathologist Christena Roberts, hired by the NAACP, says that the first cause for concern is basic physics. Lennon stood 5 feet 9, but the swing set that he was hanged from was 7 feet 6. There were no swings or anything at the scene where he was found that he could have climbed to hang himself. "His size, his stature, does not add up to him being capable of constructing all of this alone—in the dark," Lennon's brother said. In addition, the belts—believed to be dog leashes—that he was hanging from were not his, his mother insisted. "I know every piece and every stitch of clothes this child has—I buy them, I know. Those were not his belts," she told CNN. The shoes that he was wearing when he was found were not his either, his family said. He left home wearing his size 12 Air Jordans. When his body was found, he was wearing size 10 1/2 Nike Air Force shoes—which were not on his body when he was taken to the state medical examiner's office, the NAACP review stated, according to CNN. "He's going to walk a quarter mile from his house in a pair of shoes that's two sizes too small after he takes off his new pair of shoes—and this is a 17-year-old black kid with a brand-new pair of Jordans on? He's going to take those Jordans off and just get rid of them and put on some shoes that's not his—we don't know where he got them from, no laces in them—and continue to walk down this dirt road late at night to a swing set in the middle of the trailer park and hang himself?" his brother told CNN. "How can I believe that?"